They occupy many niches in food webs - most are detritivores or scavengers, some graze on algae, others are omnivores or predators on small insects and crustaceans. Food is held with the front two pairs of legs which have large claws. 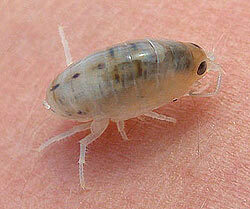 Only a few amphipods are external parasites on animals such as whales, dolphins and fish (for example whale lice). 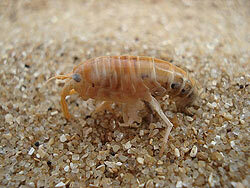 Amphipods are eaten by fish and crabs and shore birds whixh turn over large numbers of pebbles and seaweeds to find them. The body of an amphipod is divided into 13 segments, which can be grouped into a head and thorax (fused together) and an abdomen. The head/thorax has two pairs of antennae and one pair of compound eyes that are not stalked and the mouthparts. They have walking legs where the first and second. pairs have pincers or claws with the last 3 pairs pointing backwards. There is an exoskeleton that extends over the tops of the thoracic legs and covers the gills. Mature females have a brood pouch, which holds her eggs while they are fertilised and until the young are ready to hatch. There are no larval stages; the eggs hatch directly into a juvenile form, and they usually become adults after 6 moults. and video of them being separated from the macroalgae in the lab.